Difference between revisions of "Dzambhala"
'''Dzambhala''' (Skt. ''jambhala''; Tib. [[ཛམ་བྷ་ལ་]]) — a protective [[deity]] associated with wealth and prosperity. There are many different forms and traditions associated with this wealth deity but he is usually depicted as yellow in colour and holding a mongoose in his left hand. '''Dzambhala''' (Skt. ''jambhala''; Tib. [[ཛམ་བྷ་ལ་]], [[Wyl.]] ''dzam b+ha la'') — a protective [[deity]] associated with wealth and prosperity. There are many different forms and traditions associated with this wealth deity but he is usually depicted as yellow in colour and holding a mongoose in his left hand. Dzambhala (Skt. 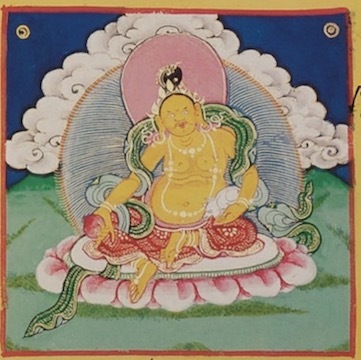 jambhala; Tib. ཛམ་བྷ་ལ་, Wyl. dzam b+ha la) — a protective deity associated with wealth and prosperity. There are many different forms and traditions associated with this wealth deity but he is usually depicted as yellow in colour and holding a mongoose in his left hand. This page was last edited on 27 October 2018, at 19:32.